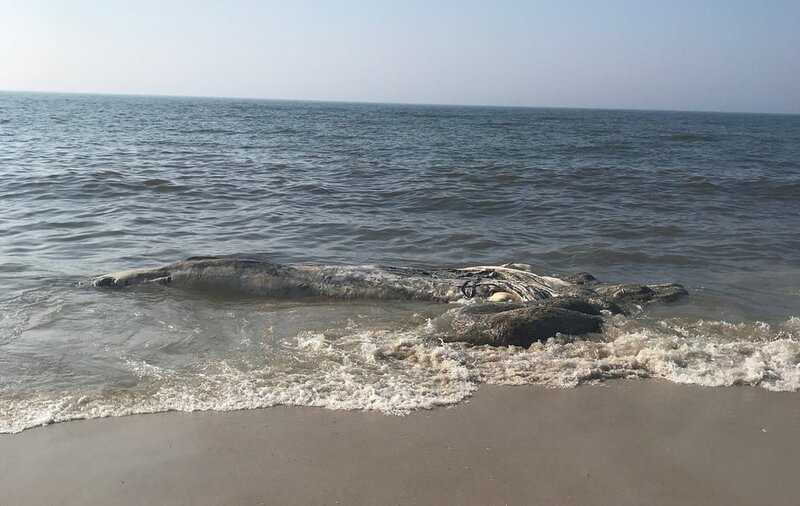 On Tuesday, August 28, 2018, Atlantic Marine Conservation Society (AMCS) was alerted by US Coast Guard Sector Long Island Sound of a deceased humpback whale floating offshore by Ocean Beach, Fire Island National Seashore (FINS). Around 6 p.m. in the evening, FINS called AMCS to share the whale had beached between Kismet and the Robert Moses Lighthouse. The team formulated a response which took place the following day, Wednesday, August 29. AMCS arrived onsite in the morning to assess the stranding, and returned later again in the afternoon to work with local authorities to remove the animal from the surf and conduct a stranding investigation. The animal was severely decomposed and the carcass was not intact. Due to the level of decomposition, a necropsy examination was limited. AMCS was able to determine the animal was a male, may have been approximately 34 feet in length, and found lacerations consistent with vessel strike. Samples were taken to send to a pathologist to help confirm a cause of death. Those results can several months. Remains were buried on the beach. AMCS is grateful for the support received from Fire Island National Seashore, NYS Department of Environmental Conservation, National Oceanic and Atmospheric Administration, National Park Service, Robert Moses State Park Maintenance, the Ocean Beach Police and community. On Sunday, May 27, 2018 Atlantic Marine Conservation Society (AMCS) was made aware of a deceased humpback whale on Fire Island in the Point O’ Woods area. This was the third reported humpback whale of the month and the year. In coordination with Fire Island National Seashore, NYS Department of Environmental Conservation, and local authorities, AMCS scheduled the necropsy for the following morning. The necropsy was completed on Monday, May 29, 2018 with support from Fire Island National Seashore, NYS Department of Environmental Conservation, National Oceanic and Atmospheric Administration (NOAA) Fisheries, Point O’ Woods Association, and Suffolk County Police. The whale washed ashore in a piping plover area, which are a species listed as “Threatened” under the Endangered Species Act. With this in mind, the team was diligent about respecting the area these birds live in as to not cause harm or distress. The female humpback whale was 33 feet long and could have been between three to five years of age. AMCS biologists found evidence of blunt force trauma consistent with vessel strike. The whale was fairly decomposed and samples were taken and sent to a pathologist to help confirm the cause of death, the results of which may take several months to come back.